Oceanside, CA - October 4, 2017 - USA Beach Handball is pleased to announce the United States has been selected to host the 2018 Pan American Beach Handball Championships. The competition will take place March 6 – 11, 2018 in Oceanside, CA, north of San Diego. The tournament is open to men’s and women’s senior National Teams from North, Central, and South America as well as Caribbean countries. A total of 20 teams will compete, 12 men and 8 women, with the top four teams in each gender advancing to the World Beach Handball Championships in Kazan, Russia, July 2018. The Championships will be the headline event featured in a long weekend of sports, music and food, representing various countries in attendance. There will be four days of tournament play with the medal matches played on Saturday and Sunday in the famous Amphitheater next to the Oceanside Pier. 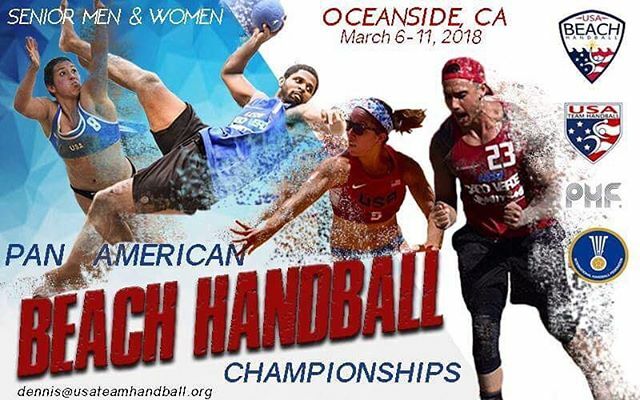 USA Beach Handball looks forward to hosting the event on the beaches of Oceanside, CA, recognizing the experience the city has in hosting high profile beach events. The Pan American Beach Handball Championships will be managed through a Local Organizing Committee (LOC) and will work closely with strategic partner and supporter in the area. The USA Beach Handball Program was founded in Southern California in late 2015 with the Men’s Team, who went on to become the Pan American Champions only six month later. The Women’s team relocated to the Hermosa Beach training site a year later, and the Jr. Men’s team soon joined the ranks. USA Beach Handball is a discipline of USA Team Handball located in Colorado Springs, CO.